This document describes the installation of a power antenna/aerial to an E series falcon/XG/XH series Longreach to replace the standard fit manual item. It covers falcon and non falcon antenna replacements, and how to fit them to GLI/Futura/S pac models. ** not required when installing a falcon specific replacement antenna. 1. A Ford antenna out of a Fairmont/Fairmont Ghia/LTD/Fairlane. These vary in cost from anywhere (depending on the condition of the unit) from $30 - $150 approx. The advantage is that they will fit in the wheel arch cavity without modification. The disadvantage is that the raising/lowering of the unit is controlled by the Body Electrics Module (BEM) (EF/EL high series equivalents) or Central controller (EA-ED high series equivalents). This requires fitment of a high series (Green) BEM or high series central controller and the dash control switch. This requires modification of the BEM/central controller wiring. This document will explain how to wire this antenna without the extra electronics. 2. A non Ford antenna. There are various makes available â€“ Aerpro make a model that is an exact replacement for the genuine Ford unit, with the advantage that the raise/lower functions are integral with the unit. The disadvantage is that they are somewhat pricey â€“ around $120 at the time of writing, they are available from auto outlets such as Supercheap Auto/Autobarn, etc. Having said that though, they are likely the most attractive (and price efficient) option compared to fitting a full high series system with ford antenna/control switch/BEM/Central controller. You can also use â€˜universalâ€™ units that have full automatic/semi automatic function, they start at around $40 and up, but require some modification to the antenna mast and the wheel arch cavity bracket for fitment. These units typically have hemispherical shaped plastic adaptors to fit to the upper fender â€“ these look great on a HQ Kingswood, but not on an E series Falcon or XH Longreach â€“ take the time to mod the mast adaptor, as explained later on in this document. Iâ€™d suggest some prior research by going to a few auto part outlets and seeing for yourself what is available and the prices. 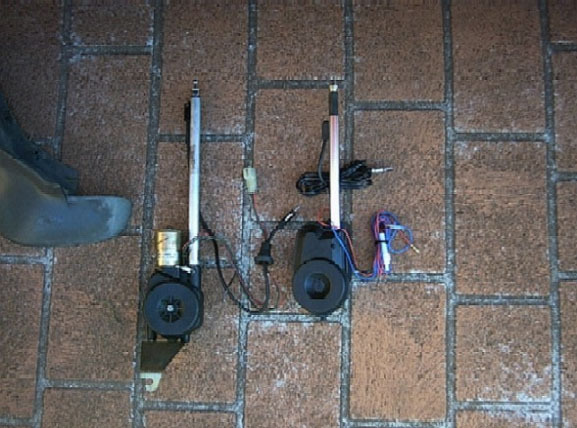 Do make a point and check out a specific manual antenna designed for your model falcon, and note the design of the antenna mast tip â€“ this gives you an idea as to whether your intended power antenna unit can be modded, or is a straight install without modding. If you refer to Fig 1. below, also note that universal units have shorter antenna masts than the falcon specific replacements. The examples used in this document are a genuine Ford antenna fitted to an EL Futura wagon, and a Soundtech universal antenna fitted to an XH Longreach ute. See Fig 1. below â€“ the Ford unit is on the left, the Soundtech unit is on the right. This is important as you donâ€™t want to install your unit and find that it doesnâ€™t work !! 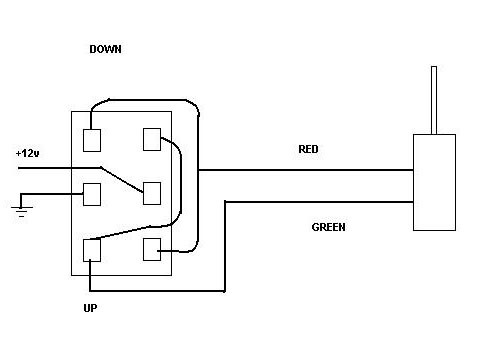 Youâ€™ll notice above that the ford unit has two wires to a plug, red & green â€“ connect 12v to these wires, +ve to the red, -ve to the green, the antenna will extend, keep power on for a few seconds after the antenna has fully extended, to test operation of the motor slip â€“ this stops the motor burning out. Reverse the polarity of the 12v power and ensure that the antenna retracts correctly, and check the motor slips again after full retraction. During retract/extend operations, the movement should be reasonably smooth and there shouldnâ€™t be any excessive binding â€“ binding puts extra load on the motor, and can burn it out over long term operation. Since the ford unit will be likely a second hand unit you can relubricate the winder assy if you feel it necessary. You can remove the mast by removing the self tapper screw near the mast base, undo the retainer screw and open the casing to gain access to the winding unit. Full instructions are not included here, but the user should be able to figure this out â€“ the main points are to be careful and note where everything goes on disassembly, to aid reassembling the unit. Youâ€™ll probably find reinserting and engaging the plastic toothed cable assy to be a bit fiddly. Preferably you should use an electrical type grease such as silicon grease for lubrication, although any light grease should be fine. The non ford unit in Fig 1. is typical of most aftermarket units: a black wire for earth or -ve, a red wire for +12v, and a blue wire for sensing which connects to the car radio. Some units use a green wire as the sensing wire. Test this unit by connecting 12v to the respective wires mentioned in the last sentence, but leave the blue(or green) wire unconnected. Touch the blue(or green) wire (and keep it touched) to the red wire (+12v). You should find that the antenna extends and runs for a second or two, then stops. Disconnect the blue(or green) wire from the red wire, you should find that the antenna retracts and runs for a second or two, then stops. Alternatively, you may find some units that continue running, this is simply the winder slip system operating. Ford Genuine Antenna/Falcon specific replacement: You need to first, either, jack the car and remove the front left wheel, or park the car with the steering on full left lock â€“ this gives you access room to the wheel well. 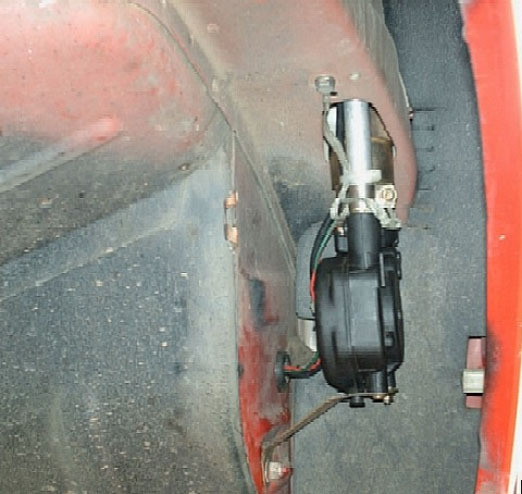 If youâ€™re turning the steering with the car stationary, jack the front up while doing it to lower the strain on the wheels and hence the steering rack. Using a phillips head screwdriver, remove the screws attaching the front mudflap to the fender. Remove the wheel arch plastic surround, youâ€™ll need to bend the two â€˜half moonâ€™ metal tags at the wheel arch rear, and prise out the two overhead plastic retainers, use your sidecutters or two flat blade screwdrivers for the plastic retainers. Fig 2.shows the wheel arch with the cover removed and the manual antenna still fitted. EL series shown, but typical of all E series. Prise the coax wire grommet and carefully pull the cable out into the cavity until you can access the plug connector, disconnect the plug. (EA, EB, ED, XG) Prise the grommet from the top of the fender - take care not to damage the paint finish. (EA, EB, ED, XG) Remove the antenna mast retaining nut and washer. (EA, EB, ED, XG) Remove the antenna earthing bolt, remove the antenna. (EA, EB, ED, XG) Fit replacement power antenna, in the case of a falcon specific unit, locate top fender mounting point, insert antenna mast through the horizontal bulkhead access hole, position the antenna mast top in the top fender mounting point, install the retaining nut and washer. Install the upper fender grommet. (EF, EL, XH) Using a 10mm socket, with ratchet and extension, undo the antenna mounting bolt. (EF, EL, XH) Using moderate force, pull the antenna down and clear of the upper fender plastic retainer. (EF, EL, XH) Fit replacement power antenna, in the case of a falcon specific unit, locate top fender plastic insert, insert antenna mast through the horizontal bulkhead access hole, push and seat the antenna mast top in the top fender plastic insert â€“ firm force is required here. Locate the lower antenna bracket mounting point and position the antenna unit on it. Check the upper fender exit point for the antenna, make sure the antenna tip when fully retracted is either flush or recessed below the upper fender antenna mount plastic insert, if not, support the antenna assy, perhaps cable tie it to one of the plastic wheel arch cover metal tags, and remove the antenna lower bracket (phillips head screw & 7/8mm bolt). Adjust the bracket bends, and refit to the antenna unit. Check the antenna tip position as previously explained. When satisfied, position the lower bracket assy on the mounting bolt and attach a suitable fitting nut, tighten the nut with your shifter. 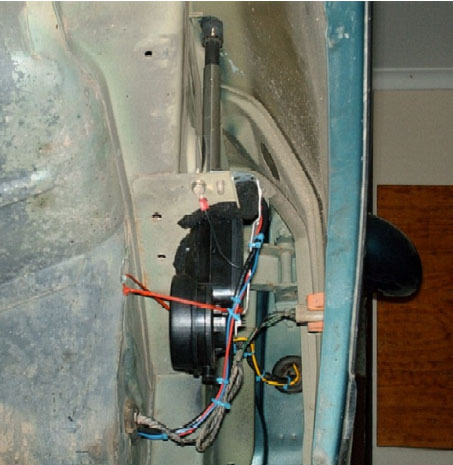 Fig 3. shows the lower mounting bracket and the antenna unit fitted, and where it attaches onto the wheel arch cavity. Perform a quick retraction/extension test on the antenna to ensure the upper fender plastic insert doesnâ€™t foul the antenna mast. Remove the grommet from the old antenna coax line â€“ split the grommet by using a Stanley knife blade, donâ€™t cut the old coax lead, just in case you need to reuse your old antenna. Fit the grommet to the replacement antenna coax line â€“ feed the other electrical wires through it as well. Using the old antenna mounting bolt, bolt the new antenna earthing braid wire (if there is one) to the wheel arch using the old antenna mounting bracket location. If there is a black lead for â€“ve power (non ford units), you can fasten it here also. Inside the cabin, prise the two left cabin kick panel retainers, use the two flat blade screwdrivers, remove the kick panel to expose the ECU area. Feed the grommet with coax and other wires through the bulkhead hole into the cabin. Fit the grommet to the hole with the split positioned at the bottom. Secure the wiring in the wheel arch with cable ties â€“ make the wire loom enter the bulkhead grommet in an upwards direction â€“ this allows any water to drain instead of running along the wires, through the grommet and into the cabin. Refit the wheel arch plastic surround, and refit the front left wheel if removed. Installation is the same as described above, however, as previously mentioned the mast is shorter, and for EF, EL, XH, it may not be a plug in fit to the existing upper fender plastic insert. For EA, EB, ED, XG, you need to ensure the antenna mast mounting hardware is compatible. A mounting bracket to support the antenna also needs to be made or bent up. The Soundtech antenna used in this document had a metal screw on retainer, this could be refitted in reverse, the shank was ground down to match using a benchgrinder, see Fig 4. below, ford antenna to the left, soundtech to the right - this is applicable for EF, EL, XH. Fig 4. Soundtech antenna tip(right) modified to match Ford antenna tip(left) â€“ the collar is required to engage the upper fender plastic insert. The horizontal bulkhead access panel hole will need to be enlarged to enable the antenna unit to fit through, as the antenna motor assembly will sit higher in the wheel arch. Leave the anchor nuts as they are, as they can be used as extra mounting points for the antenna support bracket. Be sure to use protective eyewear and ear defenders when using the angle grinder. Fig 5. shows an XH Longreach wheel well with the bracket modified â€“ similar to E series, except it is not a full bulkhead. The lower bracket mounting stud is also non existent in the XH. The antenna unit rests against the modified bracket half, insulated with foam strip, along with some generic metal strap as a bracket â€“ the cable tie adds extra support â€“ the installation is quite robust, despite how it looks at Fig 5. Fig 5. Soundtech universal antenna fitted to an XH. You should find your unit has some generic strap metal strip for use as brackets â€“ you can bend this to suit, or make your own, this is up to you. When fitting your antenna, modify your bracket to ensure your antenna mast has a slight backwards slant when the antenna is extended. This will most likely be needed to be done several times till you are happy with the setup. 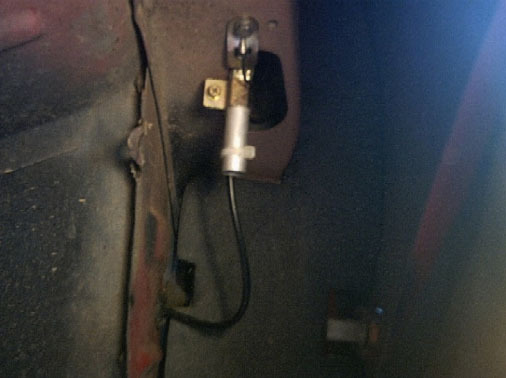 In the case of a Genuine ford antenna, you need to wire your antenna up to a direction switch, which is connected to +12v and an earth, refer to Fig 6. below. The control switch will need to be a 3 position item, i.e. have a centre, up, and down position. Centre is for disconnecting power to the antenna. 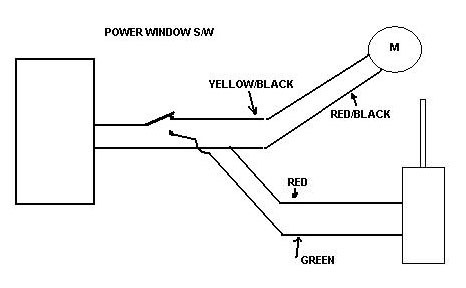 You can also use a power window switch for this purpose also, and it is wired up the same as in Fig 6. You can position your switch where it is most convenient, perhaps either in the dash or centre console. +12v power can be drawn off the cigarette lighter power or power windows(where fitted), for example â€“ the power antenna doesnâ€™t draw a high current. Fig 6. Wiring up a Genuine Ford antenna. If your car has power windows, you can wire up a power select switch that toggles power between the front passenger window, and the antenna. You then use the front passenger power window switch to raise/lower the antenna, or the window. Refer Fig 7. The red/black wire for the front passenger window goes past the front left kickpanel, so the red wire of the antenna can be connected there â€“ the green wire can be run under the carpet over to the centre console, and the switch can be positioned in the centre console glovebox area. Wiring up a non ford genuine Falcon specific replacement or a universal fit unit is easier. These units are either fully automatic or semi automatic. Simply run the +12v wire (usually red) and the sensing wire (usually blue or green) up to behind your car stereo, splice the +12v line into the accessories power line â€“ or if you prefer constant power available to the antenna, to the constant power line. The sensing line goes to the radio positive trigger line. Donâ€™t confuse this with the existing blue/red wire for lighting. You may find that the radio plug has no positive trigger pin â€“ this will need to be inserted. Secondhand instrument cluster/clock or stereo plug pins will fit. For pin out details on the standard Falcon stereo plugs, refer to the associated documents list mentioned earlier in this document. Use the model that is applicable to yours â€“ for XH series, use EF/EL. Optionally for a degree of manual control, you can insert an on/off switch in the antenna +12v line, you can then leave the mast at any height you desire â€“ rather than the antenna raising and lowering with the switching on and off of the stereo. This works by interrupting power to the antenna while it is raising or lowering. Refit the LH kick panel assy. Q: Do I need to run any relays ? A: No, the power antenna unit only runs a couple of amps at most (if that), so most switches will handle that easily enough. Simply check the switch rating. Q: So are all E series antennas interchangeable ? A: No, there are differences - E series should be treated as two groups, (EA, EB, ED, XG) and (EF, EL, XH). Do read the "Selecting the power antenna" section, as prior research is essential before you purchase your intended replacement antenna. "Installing the antenna in the wheel well" also contains model specific instructions. Q: Is there any ongoing maintenance needed on power antennas ? A: No, not really. If itâ€™s a 2nd hand unit, as mentioned earlier, you may want to lubricate the winder unit. The main issue is ensuring the unit operates without binding, as binding puts stress on the motor. The unit will have rain water draining through the mast and the lower winder assy at times, but provided the drain hole/tube is not blocked, this shouldnâ€™t provide any issues. Have a look at http://www.popularmechanics.com/automotive/sub_care_sat/1272311.html Â .
Q: Iâ€™ve read through this doco â€“ but do I need a Green (High series) BEM to run a Fairmont Antenna ? A: No, read the doco again, it covers some options on how to wire up your antenna. Q: I donâ€™t understand, I thought the genuine ford power antennas are the same with aftermarket units ? A: No, there are differences, read the â€˜Selecting the Power antennaâ€™ section again. Q: Iâ€™m running a non ford stereo, can I still run a power antenna ? A: Yes, the antenna wiring will be the same as for a Ford stereo. Your aftermarket stereo should still have a trigger or sensing wire. Q: Can you get replacement masts for a power antenna ? A: Yes, Aerpro make replacements for their own units â€“ check auto outlets, ford make the same for theirs. The mast assemblies for both are the same diameter, and may be interchangeable â€“ itâ€™s worth investigating as youâ€™ll find the Aerpro replacements will be cheaper than genuine ford ones. Q: How do you fit a replacement mast for a power antenna ? A: Remove your antenna from the car. Undo the mast retaining grub screw. Partially remove the mast. Apply power to extend the antenna, remove the mast and cable. Remove power. Insert new mast while inserting actuating cable into the winder feeder. Apply power to retract the antenna, monitor actuator cable so its winding on the winder assy. Disconnect power. Install mast and refit grub screw. Apply power to retract and extend the antenna to seat and settle the cable. Install antenna in car. Q: There seems to be a lot of work involved installing a â€˜Universalâ€™ antenna ? A: Well, as is usually the case, itâ€™s cost versus time available. Youâ€™ll save around $60 - $80 using a universal unit, but it will take you longer to install. If you leave the install to an auto electrician, that will add $100 - $150+ to your install costs as well. Hopefully this doco will inspire people to realise that they can do it, save money, and get some satisfaction in doing it themselves â€“ it isnâ€™t that hard. Provided you think about whatâ€™s involved, plan it out, starting with your antenna selection, youâ€™ll find the process considerably easier. Document written by: snap0964 on 16 2006>, Copyright © 2006 snap0964, all rights reserved.